Chimpanzees at the National Chimpanzee Sanctuary in Keithville, La., known as Chimp Haven. Famed primatologist Dr. Jane Goodall says the decision by the National Institutes of Health to remove 110 of its chimpanzees from invasive biomedical research is a “hugely important first step” toward ending experimentation on man’s closest biological relative. But there is considerable controversy over where most of the chimps will be moved, and concern about the health of some chimps. 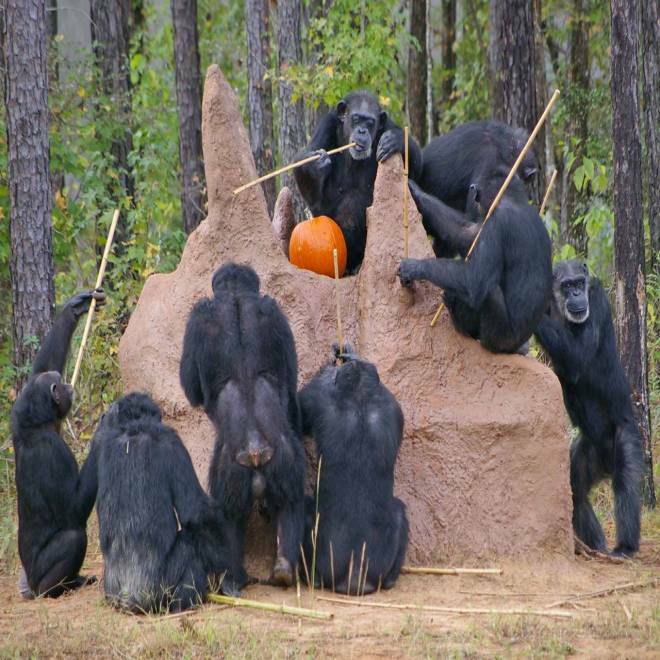 Today, in the wake of that controversy, the NIH tells NBC News that it is reconsidering the plan announced last month to send 10 chimps now living at the New Iberia Research Center in Louisiana (NIRC) to the National Chimpanzee Sanctuary in Keithville, La., known as Chimp Haven, and the remaining 100 to a research lab, Texas Biomedical Research Institute in San Antonio, Texas. NIH now says as many chimps as possible will be moved to Chimp Haven before the end of August 2013, and that eventually all 110 chimps will go there. “NIH is considering all options to try and move as many of the 110 chimpanzees to the Federal Sanctuary within the constraints of this timeframe and to eventually move all 110 chimpanzees to the Federal Sanctuary. In the meantime, NIH must continue to care for the chimpanzees and Texas Biomedical can offer high-quality care until the Federal Sanctuary has the capacity to take all 110,” according to an NIH spokesperson. NBC News’ Rock Center visited Chimp Haven and the Texas Biomedical Research Institute last year in a story about the morality and scientific necessity of invasive biomedical research and about whether older chimps that have lived their entire lives in labs should be retired to the relative freedom of a sanctuary. Famed primatologist Jane Goodall visited Fauna Sanctuary oustide of Montreal, Canada. Goodall was reunited with former lab chimpanzees that she helped rescue from a lab in New York.&nbsp; The sanctuary is home to 12 chimpanzees. Lisa Myers reports. Sen. Susan Collins, R-Maine, also called the decision to spare the chimps “a step in the right direction” but added “I am concerned that so many of these great apes are being relocated to another lab rather than to sanctuaries.” NIH is officially deeming chimps headed to Texas Biomed as “research ineligible” rather than “retired,” an official said, because the status of “retired” can only be applied to chimpanzees placed in the federal sanctuary. 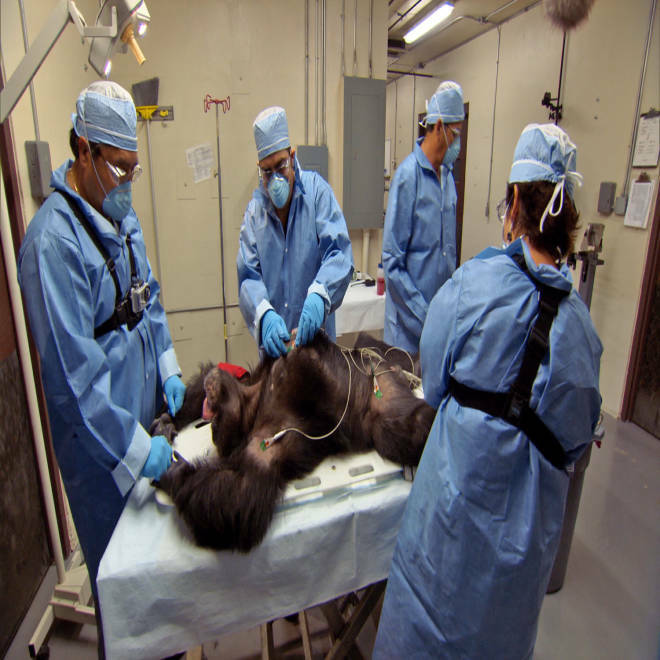 A chimp is sedated to draw blood in the effort to find a cure for Hepatitis C at Texas Biomedical Research Institute in San Antonio, Texas. Internal NIRC emails raised the possibility of euthanizing at least three chimps that may be too sick to tolerate the stress of moving to a new facility. “There are several NIH owned chimps that are geriatric and are chronic clinical cases,” wrote an NIRC official on Aug. 1, 2012. “I have concerns about these guys making it through transit — we will want to consider human (sic) euthanasia,” wrote an NIRC official on Aug. 1. When contacted about these emails, a NIRC spokesperson told NBC News that no one is suggesting “that any chimps be euthanized rather than be shipped.” He said it’s likely the three chimps will meet the criteria for humane euthanasia within the next year, but if they don’t, discussions are under way with NIH about NIRC caring for them beyond the Aug. 31, 2013, deadline. Ken and Rosie are 30-year-old chimpanzees that were born in research labs and have spent most of their lives in labs dedicated to finding cures for human diseases. Some experts who support medical testing on chimps believe, at some point, the animals should be retired. A visit to a sanctuary housing retired lab chimps reveals that some of the animals still exhibit symptoms of stress from their time in the labs. Lisa Myers reports. Another issue: What happens to two epileptic chimps at NIRC — Monkey and Jet? An NIRC staff member wrote on Aug. 17 that they “SHOULD NOT GO TO CHIMP HAVEN (they will be used as poster children). I would rather they stay here.” Today, an NIRC spokesman told NBC News that this is not the institution’s official position and that “the phrase “poster child” was a shorthand way of expressing concern that the primates could be used to convey an inaccurate representation of NIRC’s care.” He added that no research ever was conducted on the epileptic chimps. Ken and Rosie are 30-year-old chimpanzees that were born in research labs and have spent most of their lives in labs dedicated to finding cures for human diseases. The use of chimpanzees in invasive medical research has long been debated. Primatologists like Jane Goodall argue against the use of chimpanzees in medical research, while some researchers say testing is crucial and has saved human lives. Lisa Myers reports. Advocates for chimps are pleased by the NIH decision to forego further research on these 110 chimps, but are urging the NIH not to transfer them to another lab. 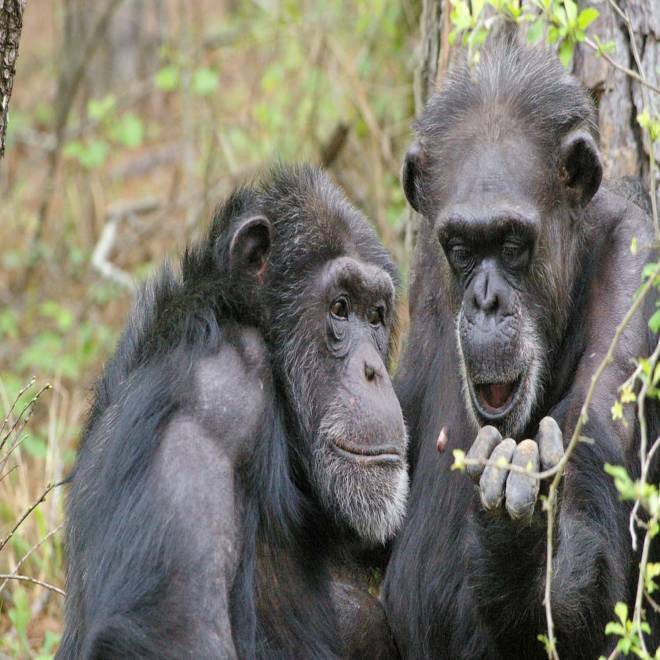 “We look forward to working with NIH and the Congress to develop a workable plan to move all of the govern-owned chimpanzees to sanctuaries in the year ahead,” said Wayne Pacelle, Humane Society president and CEO. His group and others argue that moving all chimps to Chimp Haven would save taxpayers money. Chimp Haven says it can care for all 110 chimps from the NIRC, but would need $2.5 million in construction money. The sanctuary is partly funded by taxpayers, but also relies on private donations to fund operating costs. She is cosponsor of legislation that would ban invasive research on the approximately 1,000 chimpanzees currently housed in U.S. laboratories, unless it is deemed necessary for human health in combating a disease. Under the bill, invasive research on great apes — including chimps, gorillas and orangutans — would be phased out over three years after enactment. The measure would also establish a “Great Ape Sanctuary System Fund” within the Treasury Department to pay for the retirement, to a permanent sanctuary, of the roughly 500 federally owned chimps currently in labs. The bill has been approved by a Senate committee and Collins says she hopes the Senate will pass it during a lame-duck session after the election. But for now, Goodall says her foremost concern is to free the remaining 453 federally owned chimps, as well as hundreds of privately owned chimps, from the threat of being used for invasive experiments. Other NIH chimpanzees are housed at Texas Biomed, the Keeling Center for Comparative Medicine and Research in Bastrop, Texas, and the Alamogordo Primate Facility (Chimpanzee Reserve) in New Mexico. NIH says it still has made no decision on the fate of 14 chimpanzees that were transferred to Texas Biomed two years ago to be available for hepatitis-C experiments. This move rekindled the public debate over the use of chimpanzees in invasive biomedical research and was the focus of NBC’s Rock Center’s two-part segment, which featured two aging chimps, Ken and Rosie. The Physicians Committee for Responsible Medicine has petitioned NIH to retire these chimps, which veterinarians have said have health issues. Additional resources: For more information on the National Chimpanzee Sanctuary, Chimp Haven, click here. For more information on the Texas Biomedical Research Institute, click here. For more information on Jane Goodall’s work and the Jane Goodall Institute, click here. To learn about a group of lab chimpanzees that Goodall helped get placed in the Fauna sanctuary outside of Montreal, Canada, click here. To learn more about the Great Ape Protection Act that Goodall is working to pass, click here. Rock Center was granted unprecedented access to the Texas Biomedical Research Institute. The Institute uses chimpanzees in their research to find a cure for Hepatitis C, a potentially deadly virus. Meet the chimpazees in the lab. Lisa Myers reports.